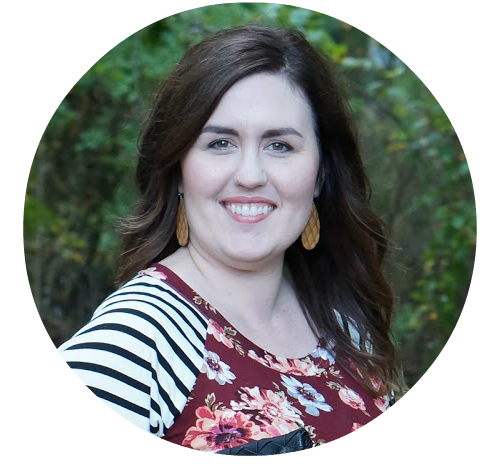 This post is a first for me, because I’ve never shared Will’s and my anniversary. We recently celebrated our 12th wedding anniversary. I wanted to share what we gifted each other (it’s the linen wedding gift year!) and where we ate. We made reservations at our favorite restaurant Chef and the Farmer in Kinston, NC. We got married in 2006, and every year since then we have exchanged traditional wedding gifts. We thought it would be a lot of fun to go by the traditional gift list. You can find a couple different lists out there on the internet. There’s a traditional one and a modern one, and we chose the traditional one. We both loved the idea of having a category, such as ‘cotton’ or ‘paper’ and then just running with that idea to purchase a gift that suits the other person. We were right — it has been SO much fun. Just to give you a couple examples, I ordered him a magazine subscription for the ‘paper’ year. For the ‘wood’ year, we purchased a book shelf together because we really needed more space for our books. This year, the category is linen. To be honest, I knew this one was coming and I’ve been racking my brain to think of a gift. A month before our anniversary, it dawned on me that I should make something. Will has a small collection of handkerchiefs, and I’ve owned a book on embroidery for a number of years but haven’t attempted any projects yet. I know it was a little gutsy to gift my first project and my stitches are a little uneven (it looks worse in these huge pictures), but it was so much fun. I just followed the directions in the book (you can find it here) and went with it. 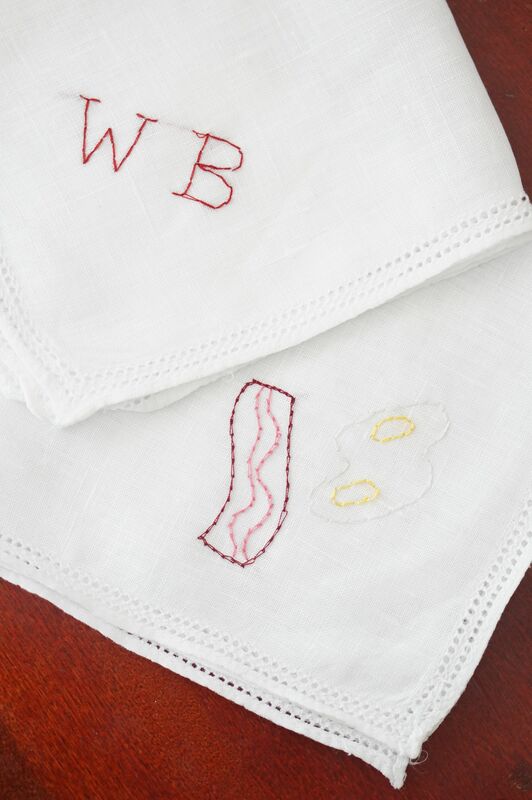 The book had a myriad of embroidery patterns, so I chose the eggs and bacon pattern for one handkerchief and embroidered his initials on the second one. He was so surprised and love them, which made me so happy. His gift surprised me, too. I’ve been looking for table runners and table cloths to fit our new dining room table. It’s pretty large, and it extends even farther to fit a total of 10 people. 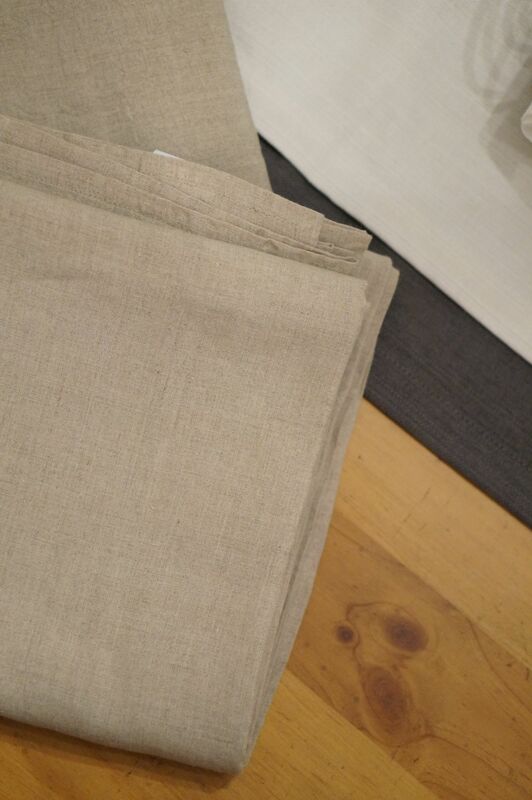 It’s been hard to find the right color of linen that I like and that actually fits the table. 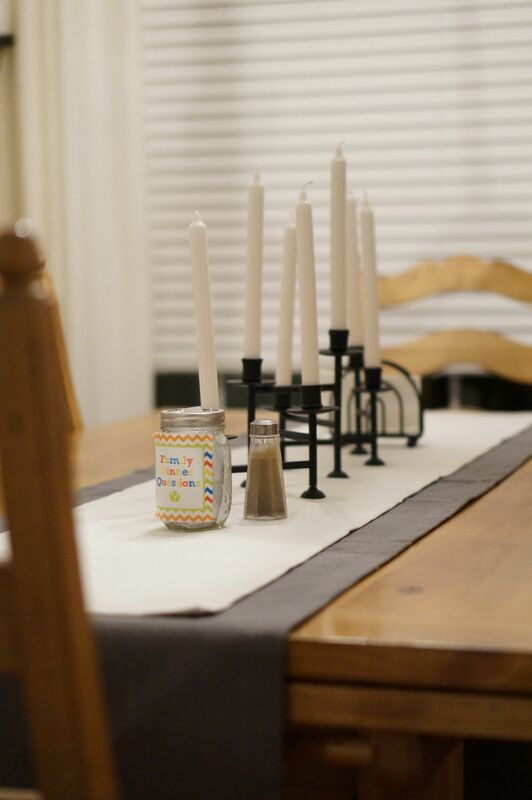 He found two table runners and two table cloths that are perfect for our table. It surprised me so much, because I had only mentioned it once or twice. On the Friday before our anniversary, we made reservations to eat at Chef and the Farmer. It’s a little progressive eatery in Kinston owned by Vivian Howard. The first time we ever went to Chef and the Farmer was in 2010, back when Vivian still worked at the restaurant. We saw her in the kitchen that night, but now that she has her PBS show (shows? They recently announced a new show) she obviously has other people running the restaurant day-to-day. It’s easily my favorite restaurant, because the food is always amazing and the menu is ever changing. They have a seasonal menu that is locally sourced. I thought it’d be fun to share what we ate. We ordered the peach pizza as an appetizer. It was SO GOOD. I can’t even explain how good it is. 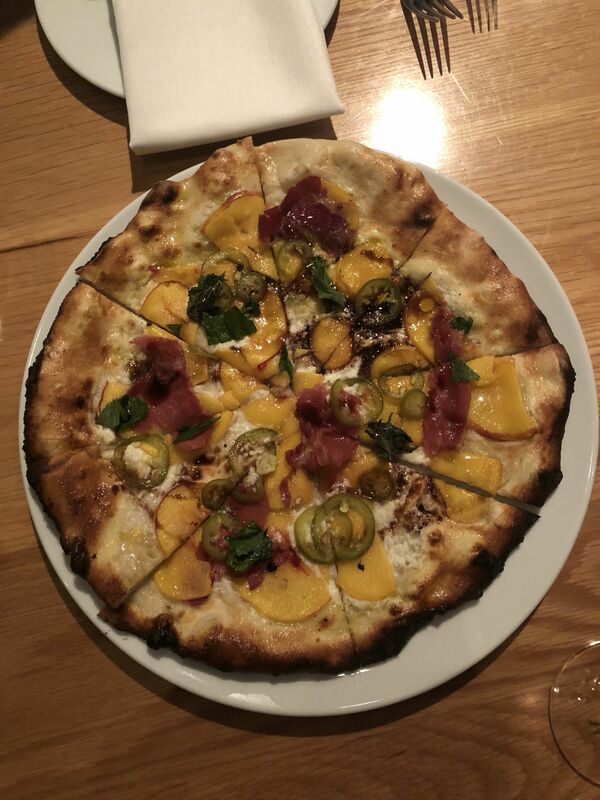 The mixture of the cheese, thin yet fluffy crust, peaches, jalapenos, and mint was perfect. We only ate half and they boxed up the rest for us. Normally, Will and I get completely different meals so we can try different things, but this time we both got the Frogmore. This is as close as you can get to Chef and the Farmer’s delicious shrimp and grits. Since their menu is always changing, you can’t always go back and get the same thing. In fact, while we were sitting there, the people at the table next to us asked about the shrimp and grits. It’s seriously so good, but this Frogmore dish is a close second. 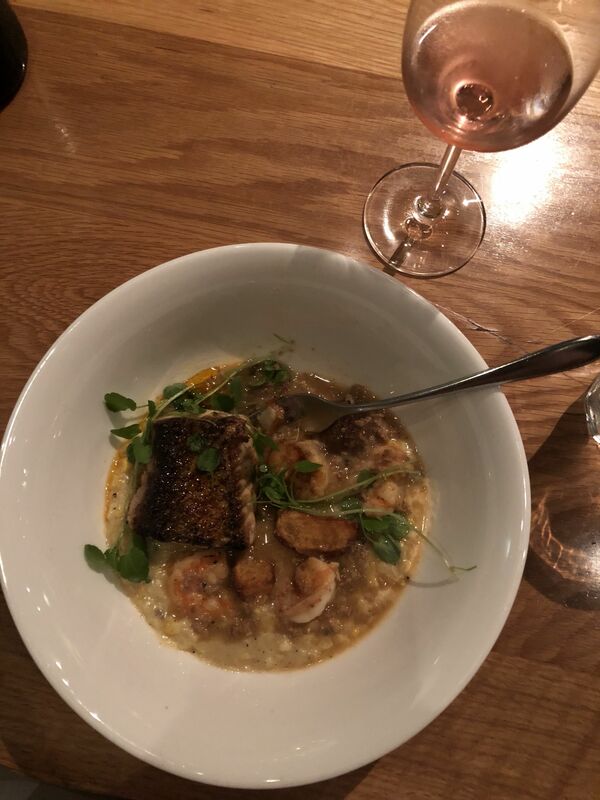 On top of a base of creamed corn and italian sausage gravy, there was pan seared snapper with shrimp. It was so delicious, I could’ve eaten another helping. 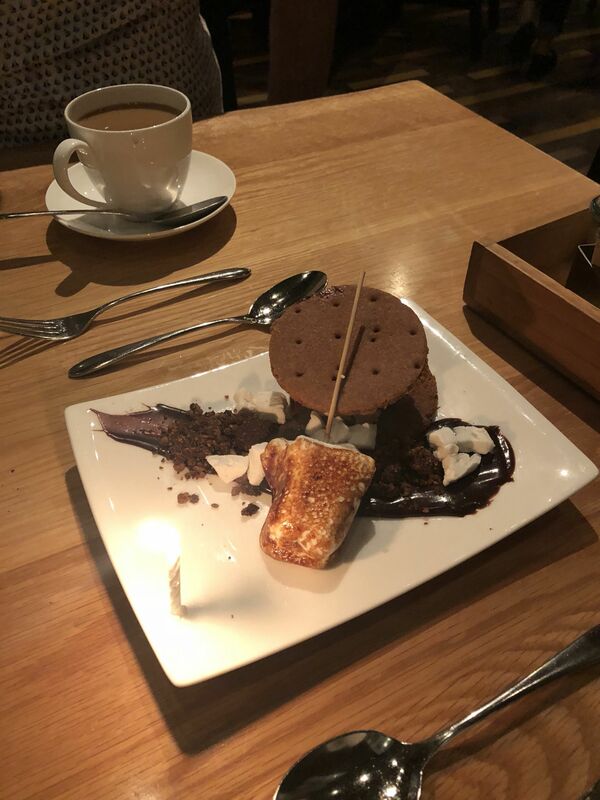 Our waitress was so sweet and lit a candle on our dessert for our wedding anniversary! That’s another thing, the staff at Chef and the Farmer are so attentive yet not overbearing. For dessert, we had the s’mores sandwich. In between the graham crackers was white chocolate ice cream. Drizzled along the plate was chocolate fudge covered in crumbled chocolate and marshmallow. A toasted marshmallow was to the side. It was rich and scrumptious, and it was a good thing we shared. I could not have eaten that by myself! If you’re married, do you follow the traditional gifts? I’d love to know!